Haze Jazze Pha premium Flavored Tobacco and Global hookah Distributors have teamed up and now we are the exclusive importer of Haze products to America. The founders of Haze were the pioneers of the USA hookah tobacco industry back in 2001 in Portland, Oregon with brands such as Sultan tobacco and Hookah splash. Those formulas were passed on to the biggest names in the market and Haze tobacco is still going strong. Haze Tobacco has partnered up and collaborated with rapper / music producer, songwriter, and vocalist Jazze Pha to create the new Jazze Pha #SmokeSxxy line. It has the usual undyed choppy cut of their original line and their "Stack and Haze" packaging is unique in how it can be stacked on top of one another for easy storage and quick mixing. Haze uses only the finest tobacco and the best ingredients. Nothing leaves their facility without a quality check to confirm the final production is "Simply the Best!" 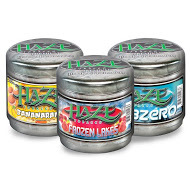 Haze has a very unique variety to choose from and their 250 gram jars allow for Hookah users to smoke several times a month or with large groups of friends. This size is packaged in round tins with a secondary sealed packaging inside. This package is resealable but prone to rust so make sure to store it at room temperature in an airtight container so that it is sure to maintain its freshness.